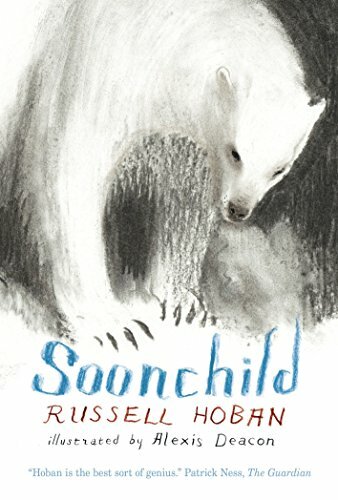 In a bracing mash-up of magic realism set in the far North of the author’s fierce imagination, Russell Hoban traverses the wild terrain of life, death, and regeneration and unearths the intrinsic duality of human existence. In his quick-paced, often startling last novel, Mr. Hoban, who died last year, once more eschews conventional expectations in favor of the precarious role of a shape shifter. The author creates his story by fusing a storm of discordant elements: genres (Is this a young-adult novel? an extended modern fable? a graphic novel for adults? ); the physical world and the spiritual; and language, mingling traditional motifs of Inuit folk literature with colloquialisms bred by a modern, consumerist society. The territory Mr. Hoban explores is internal, as each human contains a world within worlds. The protagonist of Soonchild is a shaman so full of fear he has 16 faces, not nearly enough to deal with all the dangers out there. Sixteen-Face John has taken to ignoring the unruly spirit world by settling into an ordinary life of a little hunting, fishing, carving, and trapping with a skiddoo instead of a dogsled. The impending first child, however, manages to pull John from his mundane distractions. His wife, No Problem, warns him the baby they call Soonchild is refusing to leave her womb. Their daughter’s problem, the shaman learns, is that she cannot hear the World Songs, so she refuses to believe in an existence other than the one she already knows. Thus, the bumbling father sets out on an unlikely quest to stake claim to the Master Song that contains all the songs of the world. His perilous journey demands that he confront demons both external and internal, morph into myriad shapes, enter deep trances, and create his own songs. Fortunately and unfortunately, John is not always alone in his undertaking. He encounters not only terrors but also a motley cast of vital spirit helpers, ranging from his poker-playing, deceased great-grandmother to the ice bear Nanuq. The most significant assistance, however, comes from Old Man Raven, drawn from the Inuits’ mythical trickster figure credited with creating the world. Raven, who “speaks his word of black,” can blink John into his eye and defy time, fear, and gravity, thereby enabling the shaman to rescue the song that will convince Soonchild to join her parents. The reader’s experience of this singular novel is enriched by Alexis Deacon’s powerful charcoal and pencil drawings of eerie, significant images: the ice bear’s fierce claws, the owl-woman’s watchful eyes, the snoring ton of walrus, the fangs of ghost wolves. These illustrations, combined with the author’s lyrical language, engage the reader in a magical, thought-provoking expedition. Like the wolves, Soonchild tracks “the paths of the living, the paths of the dead,” leaving readers a legacy of hard-won wisdom.